The strategies for preventing radicalization represent the most challenging dimension of counter-terrorism. Whilst many efforts have been done in repressing terrorist threats, the importance of the preventive dimension of counter-terrorism has been largely underestimated. This has been particularly the case in Italy. This article seeks to analyze the Italian strategies to prevent terrorism. In order to do so, I will divide the article in three main parts. First, I will trace a very general framework of the notion of prevention of radicalization, arguing that it is in itself a source of confusion. As a matter of fact, scholars and policy-makers have broadly considered prevention as part of repression. By stating that repression aims at disarming terrorist before they can organize and act and, therefore, at preventing a terroristic attack, repression and prevention have been reduced to the same level of the analysis. My argument is that prevention assesses the cognitive dimension of radicalization, while repression is much more related to the behavioral one. Second, I will examine briefly the Italian legal framework for the prevention of radicalization. Even if it has been criticized at different levels, the framework constitutes an important step forward for the Italian strategy in countering terrorism. Emphasizing its being a useful tool to assess the cognitive dimension of radicalization, I will outline the Italian institutional system for the prevention of the radicalization. In the conclusion, I will argue that, despite some prejudicial accounts concerning its effectiveness, the preventive dimension of radicalization is inescapable in each strategy of counter-terrorism. As stated above, radicalization is a multifaceted process that could lead some individual towards terroristic violence. Whilst there is no consensus among scholars about the mechanisms of radicalization, there is a widespread acceptance around a core element: radicalization does not entail a single process in a deterministic sense because the pathway towards violence is a combination of personal and societal conditions, and of psychological and sociological sub-processes. Although the accounting of these sub-processes goes far from the aims of this paper, two of them are crucial for assessing the prevention of radicalization: cognitive radicalization and behavioral radicalization. The first one is related to the psychological mechanisms that lead an individual towards a growing commitment with a radical ideology. The behavioral one is linked to the individual readiness to commit violent acts. Highlighting this distinction is not a mere academic exercise. On the contrary, it allows policy-makers and intelligence analysts to forge effective policies, pertinent to the purpose of counter-terrorism. Therefore, in dealing with cognitive radicalization, as a matter of psychological and socio-psychological processes, prevention is the dimension of counter-terrorism that matters more. In advanced stages of the radicalization path, when an individual starts behaving as a person prone to violence, repression is the most feasible tool to deploy. Distinguishing the difference between cognitive and behavioral radicalization allows also overcoming the very frequent misunderstandings that the notion of prevention has created among scholars. As a matter of fact, scholars and policy-makers have broadly considered prevention as part of repression. As I stated before, my argument is that prevention assesses the cognitive dimension of radicalization, while repression is much more related to the behavioral one. In order to understand how to deal with the prevention of radicalization it might be useful to unpack some of the dimensions of the cognitive radicalization. The scholarship related to cognitive radicalization has been broadly developed. However, the debate has been organized following two different directions: radicalization as a status and radicalization as a process. The first tries to find the root causes of radicalization in the very deep psychology of the terrorist, arguing that terrorism is basically a question of mindset and of misperception of the reality linked to personal mental conditions. The second is related to the idea that radicalization entails a multi-step and progressive involvement of individuals in terrorist activities, a process that is entrenched both in the individual’s psychology and in the society exogenous conditions in which terrorists are socialized. The concept of process is particularly useful in counter-terrorism because, ex definitione, a process is a multi-steps mechanism in which each phase is recognizable and assessable. This does not entail that the process is causal in a deterministic way: an individual could reach a behavioral radicalized status even if he does not experience each phase. However, the concepts of process and sub-phases have important practical effects: they imply that a radicalization process may be stopped in each of the phases in which it manifests its effects. 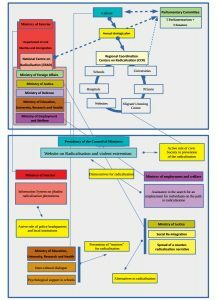 Far from offering a systemic review of the most important contributions about cognitive radicalization, I will describe the Wiktorowicz’s diagram, a useful tool for the aims of this paper. 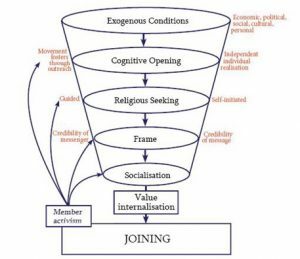 The diagram is a funnel in which an individual engages in progressive steps towards radicalization. Starting from the endogenous conditions (economic, political, social, cultural, personal), the individual may experience a cognitive opening (quest for self-realization) that could lead him towards a religious seeking that frames the world in which the individual is living. Therefore, the prevention of radicalization has to deal with these four dimensions. More precisely, prevention should intervene in the cases in which these dimensions start igniting the ideological fuel for the cognitive radicalization. Although measuring and operationalizing these dimensions is a difficult task, it is crucial in order to outline the effective strategies that should be implemented in the prevention of radicalization. A 2003 UN/CTITF report offers a good example to consider its efficacy. Analyzing the de-radicalization programs of 34 governments, the report outlines the core themes that matter for each prevention strategy: prisons, education system, inter-cultural dialogue, civic society, contrast to social and economic disparities, web (through which disseminate a counter-ideology). The Italian legal framework to prevent radicalization has been developed started from these themes. Assessing how the Italian legal framework for the prevention of terrorism has been developed constitutes the purpose of next paragraph. Whilst the repressive dimension of the Italian counter-terrorism has been excellently equipped through subsequent law enforcements, Italy has tried to acquire a legal framework for the implementation of the preventive dimension of counter-terrorism only in recent times. The first attempt to formulate a legal concept of de-radicalization could be traced back to the Law 34, 1987, whose focus was the concept of “disengagement” from terrorism. The peculiarity of that law has to be found in the discipline of the agency of the legal persons involved in the process of disengagement, the State and the radicalized individual. In that law, the active agent is the individual and the passive one is the State. In other words, disengaging from violence depends only on the individual who has to show the proofs of his disengagement; the State has only an auditor role and not a value-promoter role. As a consequence, the State is not a de-radicalizing agent and, by the same token, has no commitment to prevent radicalization. After this very timid attempt to rule the concept of disengagement from terrorism, the Italian legislators underestimated the importance of ruling this criminal type until the present days. This juridical gap lead to what Lorenzo Vidino has called “Italian delay” in absorbing international jurisprudence about the prevention of radicalization. After the new wave of terrorist attacks in Europe, from 2015 onwards, the Italian Parliament, thanks to the initiative of the Hon. Stefano Dambruoso, has started updating the legal framework for the prevention of the radicalization. The law proposal “Misure per la prevenzione della radicalizzazione e dell’estremismo violento di matrice jihadista” (2017, March 30) aims at developing an Italian framework to address the prevention of radicalization, filling the above-mentioned gap. The law proposal is composed of eleven articles. Far from being simply a list of best practices, these articles aim at structuring the Italian strategy for the prevention of the radicalization. Article 1 outlines the purposes of the law proposal, overturning the state-individual agency that was at stake in the previous Law 34, 1987. The State is no more a passive agent, but rather becomes a promoter of “measures, interventions and programs” aimed at the prevention and the disengagement from the radicalization. Article 2 institutes the National Centre on Radicalization (CRAD), which is part of the Interior Ministry’s Department of civil liberties and immigration and has the purpose of elaborating an annual strategic plan for the prevention of the radicalization in Italy. This plan establishes which project related to the prevention of radicalization will be financed annually. The plan, proposed by the Ministry of the Interior, has to been approved by the cabinet, after having heard the advices of a specific Parliamentary Committee. The CRAD is composed by a selected number of specialized professionals from different fields: Ministry of Foreign Affairs, Ministry of the Interior, Ministry of Justice, Ministry of Defense, Ministry of Employment and Welfare, Ministry of Education, University, Research and Health, and qualified experts that are employed in institutions, bodies and association operating in religious, cultural, educational and social fields. Article 3 institutes the Regional Coordination Centers on Radicalization (CCR), in the local Prefectures. The CCRs have the role to apply the approved annual plan and to inform annually the CRAD on the outcomes. The CCRs aim at monitoring schools, universities, hospitals, prisons, migrants’ hosting centers and local websites. Article 4 institutes the Parliamentary Committee for the monitoring of the phenomena of jihadist radicalization and violent jihadist extremism. The Committee is composed by five members of Parliament and five Senators. The monitoring activities are focused on the jihadist threats episodes inside the national borders and on the role of women and children in radicalization. The Committee monitors schools, universities, hospitals, prisons, migrants’ hosting centers and local websites. The Committee examines also a three-monthly relation released by the Department of the Penitentiary administration about radicalization episodes in prisons, and a six-monthly report released by the Postal and Communication Police about the situation of web activity. Article 7 set up specific training programs on the study of radicalization fashioned for police forces, military staff, penitentiary personnel, school professors and scholars, healthcare professionals. This training programs aims at educating state’s employees on the basic notions of radicalization in order to recognize and prevent the insurgence of the root causes of extremism. Finally, Article 8 frames some educational activities in schools, favoring the inter-cultural dialogue and the integrations among students from different cultures. The Law proposal clearly structures an Italian system for the prevention of the radicalization. As shown in Figure 2, through the interplaying of institutions and civic society, the structure tries to address most of the Wiktorowicz’s dimensions entrenched in cognitive radicalization. 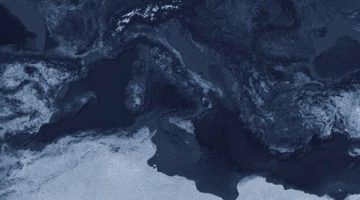 Starting from the external conditions related to the environment in which potential radical individuals grow up in the Italian society, the structure aims at offering prevention of radicalization at three different levels: preventing the motives that lead the process, offering alternatives and disincentives to radicalization. Furthermore, it entails a multi-level approach that could be inscribed in two broad categories: institutions-civic society level, national-local level. Since radicalization is a self-hiding phenomenon that could start in every context and in any time, capillarity in counter-strategy means effectiveness. Despite the “Italian delay” in addressing the prevention of radicalization, with the Law proposal of the 30th March 2017, Italy has laid the foundations of a complex structure to counter the cognitive dimension of radicalization. The Italian Formula to fight it lies in complementing the repressive and preventive dimension of counter-terrorism. Vidino, L. (2010). Countering radicalization in America: lessons from Europe. Washington, D.C.: United States Institute for Peace. Pearlstein, R. M. (1991). The Mind of the Political Terrorist. 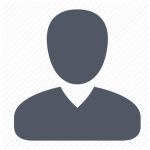 Wilmington, DE: Scholarly Resources Inc.
 Taylor, M., & Horgan, J. (2006). A Conceptual Framework for Addressing Psychological Process in the Development of the Terrorist. Terrorism and Political Violence, 18(4), 585–601. Beutel, A. (2009). Building Bridges to Strengthen America: Forging an Effective Counterterrorism Enterprise between Muslim Americans and Law Enforcement. Washington, D.C.: Muslim Public Affairs Council. Editor | Federico holds a MSc in International Relations and is currently enrolled in the Master MISLAM (Economics and Institutions of Arab Countries) at LUISS Guido Carli (Rome). He has been research fellow for the RAN (Radicalisation Awareness Network) group of the EU-Commission and he is currently working as parliamentary collaborator for the Italian Parliament. His research topics are related to security studies and radicalization processes that could lead to terrorism and political violence.